The South African Jewish Museum, situated in the "Museum Mile" in central Cape Town, provides an engaging account of South African Jewish history by means of interactive multi-media displays. 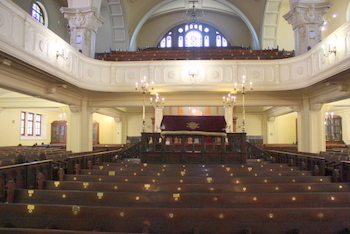 The main body of the building faces onto a paved landscaped court linking the Old Synagogue (1863) - the first synagogue built on South African soil, the Great Synagogue (1905), and the Albow Centre, which comprises the Museum Shop, the Gitlin Library, the Café Riteve, the Cape Town Holocaust Centre, and the Israel Abrahams hall. On view at the Jewish Museum are rare Judaica artifacts, animated video footage of the famous Barney Barnato and Max Rose, and an award winning documentary film 'Nelson Mandela. A Righteous Man', which is screened throughout the day. Café Riteve serves a fine selection of kosher meals and snacks, and is a venue for special occasions. The restaurant also provides kosher catering for events. The restaurant is situated on the campus at 88 Hatfield Street, Gardens. Closed Saturday and Jewish Holidays. A world-renowned selection of Nederlandish art from the seventeenth-century including works by Frans Hals, Jan Steen and Jacob Ruisdal. South Africa's premier art museum housing an outstanding collection of South African, African, British, French, Dutch and Flemish art. The Slave Lodge is a permanent museum of slavery the focus of the exhibits aim to increase awareness on issues such as human rights, equality, peace and justice. Return from Jewish Museum page to Homepage.